This is an unusual project in that it was not inspired by any actual need. 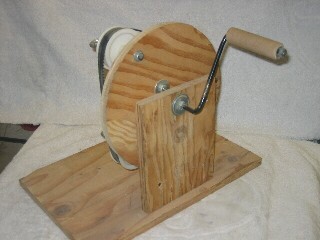 Rather, the Rope Winder (and its prototype seen at bottom) were envisioned because of a flawed Cub Scout manual. The manual in question directed the adults to simply twist wet strings together to produce the rope. This is not how rope is produced, since stable rope requires that the major strands and the strings of which they are made have opposite twists to keep it from unwinding. The inspiration here was purely for a desire to set the record straight for Cub Scouts learning the fundamentals of common materials. 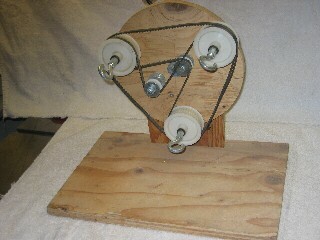 The mechanical rope winder was originally designed roughly about the time of the American Civil War. 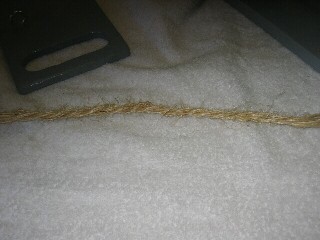 The final product will produce stable rope when being used by young Cub Scouts. Materials used are plywood (with a gloss gray epoxy finish), nylon gears and bushings, bicycle sprockets & chain, and other custom-built components. The system (below left) consists of the rope winder itself, and a hooked board (on the left) to hold both ends of the strings, since the rope-to-be must be kept under tenson until finished. The photo (below left) shows the crank handle on the shaft used for providing the initial twist to the individual fibers. 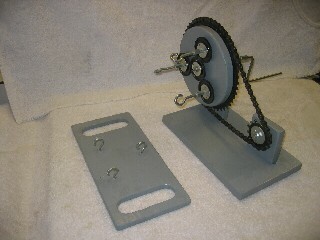 The mounting block for the the smaller sprocket is movable (see the slot in the lower right photo) to keep the chain taut, or to release it for maintenance and repair. 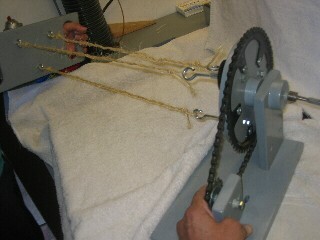 The crank handle is on the cable-twisting shaft (above right) for use after the strand fibers have been given their twist. 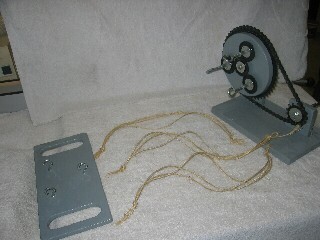 The close-up photo (below left) shows both the strand-twisting gear mechanism, and the rope-twising chain-and-sprocket arrangement. 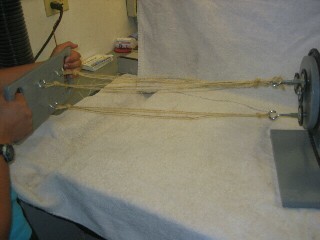 The strings are ready and tied at each end to be attached to the hooks on the board at left, and to the twisting hooks on the rope-winder itself (below right). 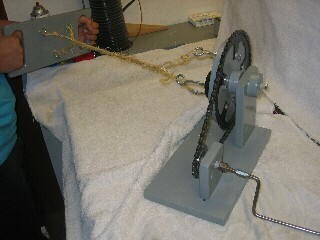 With the hooked board, and strings in place (below left), the crank handle is turned (clockwise) on the rope winder (below right) to put the initial twist to the rope strands. 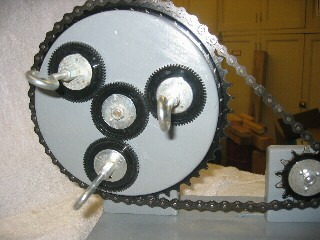 Nylon gears were used (see above left) to reverse the direction of twist. This was to keep both twisting operations using a clockwise direction so as not to confuse the cub scouts. 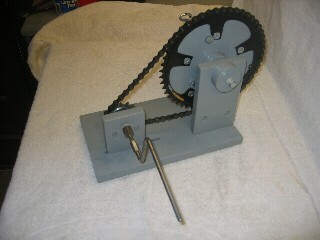 The hand crank is moved to the left-hand shaft (below left) and turned clockwise to impart the final twist to the new rope. The combination of clockwise and counter-clockwise twists serves to keep the final product (below right) stable and free from the tendency to unwind. For best results, the winder should be clamped to a table, and the hook board on the left kept with the strings under constant tension so that the rope does not bunch up until both sets of twists have been applied. The original prototype (below) went through many design revisions to understand the operation of the original (historical) mechanism. Although the prototype does not produce good rope, the multiple phases it went through were sufficient to understand the proper mechanism. It is also convenient to leave concerns about finished appearance out of the initial development stage.